Born and raised in southwest Louisiana, “Cajun Country,” George Rodrigue (1944-2013) preserved on his canvas what he feared was his dying heritage — including its land, people, traditions and mythology. It was a Cajun legend, the loup-garou, that spawned his most famous series, The Blue Dog. Throughout, Rodrigue considered himself aligned with Surrealism, Pop, and Abstract Art —associations that are increasingly obvious in his late works. The artist’s tremendous output, even during his illness, demonstrates his interest in bold colors, abstract shapes, large scale, and non-traditional materials. 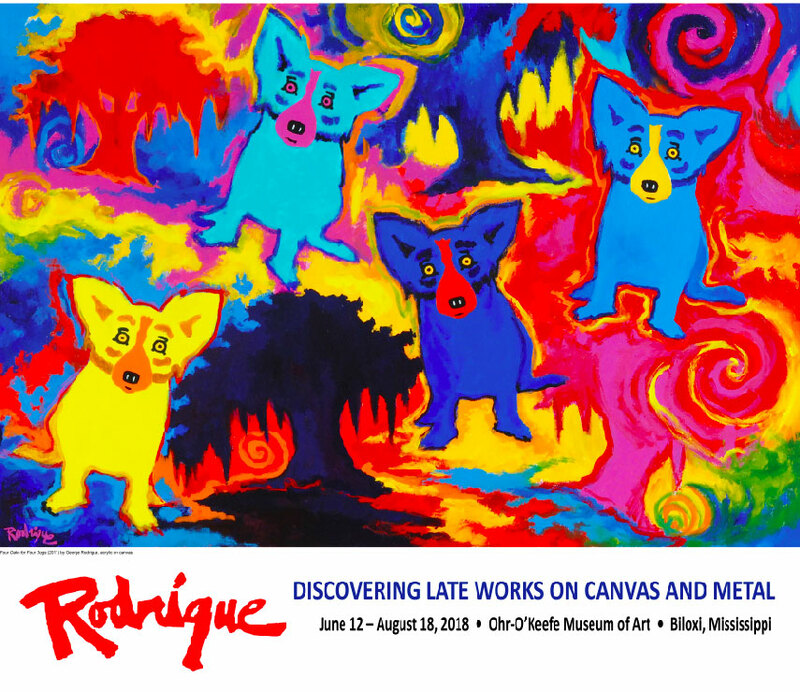 Drawn exclusively from the Rodrigue Archives and the artist’s private collection, Rodrigue’s Blue Dog: Discovering Late Works on Canvas and Metal features twenty-five contemporary and rarely seen works of art created during the last decade of his life. Also included is his first painting without reference to the Louisiana landscape, a striking and pivotal work from 1991 that marked the beginning of the artist’s Blue Dog Series. Finally, selections from Swamp Dogs and Hollywood Stars combine Rodrigue’s love of reflective metal surfaces with painting, photography, and modern technology.